We are manufacturers and suppliers of Wood turning tools. IT IS SUITABLE FOR TURNING, FACING, PARTING, LAPPING, DRILLING & REMMERING WITH HIGH PRODUCTION AND GOOD QUALITY. ALL THE PARTS OF THIS MACHINE ARE HARDENED AND GROUND. 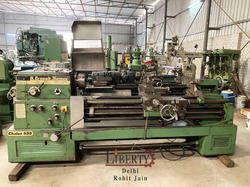 We are engaged in offering to our customer a wide range of Roll Turning Lathes. We are reckoned entity of this domain affianced in providing an enhanced quality Glass Turning Lathe.